It’s a rainy day here in Bellingham, Washington but even with the rain, it’s been an exciting morning. It started early with a meeting at Bramble Berry with a contractor to talk about adding on to the Bramble Berry warehouse. We’re going to move forward with a designer next week and see if our dreams of building on to our existing building become a reality. We all have our fingers crossed. I’ll be sure to keep you all posted if we really do start to build (eventually!). Since it’s raining, this afternoon I’ve been stuck inside with a hot drink, in comfy clothes and shopping on Etsy. It’s been a lovely way to pass the afternoon. My love of letterpress borderlines on obsessive (previous purchases here, here, here, here, here, here, here and our wedding invitations were letterpressed as well) and matches up to my sincere feelings that snail-mail notes are the best way to make an impression. 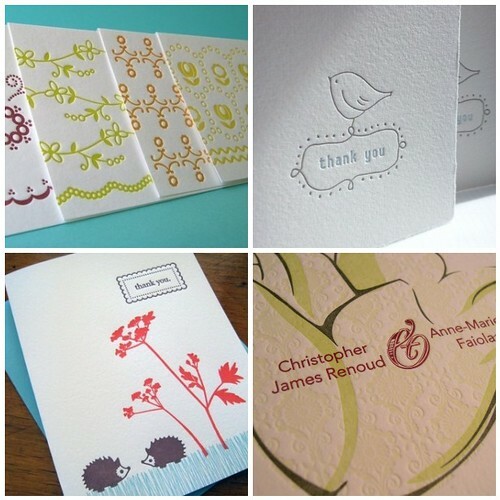 I purchased the above letterpress cards today by SweetBeets, Ave9River, and LuckyBeePress. I’m excited to send these beautiful missives out into the world and only wish they were here today because a rain day is a perfect excuse to stay inside and write thank-you-cards. You have gotten me hooked on letterpress cards, THANK YOU VERY MUCH, Anne-Marie! Theres no way Id be able to convince you not to buy such cute things! yes, i was very pleasantly surprised on that day I got my very first BB order. With a handwritten note from you. It was the beginning of an endearing relationship that also helped me start my business off right. I now handwrite a note every single order I send out no matter how small. With a coupon of course, and a free sample….we are learning from the best! I see where your issue is, there is no way that you could you resist those sweet little hedgehogs and that cute little birdie. LOL! You're as cute as the cards you bought, A-M! I love both thank-you cards! I have a friend who uses antique presses to create her cards. So fun to watch her!